Each time I approach the Metaphysical with the hopeful expectation that this time I will find something that speaks to me. I stand there for a while, feeling embarrassed, afraid someone might see me. I look for an escape route. The Philosophy section is close by. The Psychology section even closer. Once I establish that I have plausible deniability, I relax a little and quickly peruse the books. Inevitably, though, I discover that I have once again wasted my time. There’s nothing there that speaks to what I call “Paganism”. If you’ve visited the Paganism section of any bookstore, you know what I’m talking about. The Pagan books are sandwiched between books on UFOs and vampires on one side and books on divination on the other. And the Pagan books themselves are not much better: Lots of Wicca 101 teen witch kind of stuff. There’s usually Starhawk and Drawing Down the Moon, but I’ve long ago exhausted those resources. I always leave feeling a mixture of disappointment and embarrassment. The truth is, the most useful (small-p) “pagan” books I have found over the years are not found in the Paganism section at all. In fact, they don’t even include the word “Pagan”. What makes it “pagan” then? Well, that’s going to vary from person to person. But for me, pagan writing is writing that awakens my senses to the sacred in the physical world. Here’s some “pagany” books that you won’t find in the Pagan section of the bookstore, some I have read and some I want to. What naturalistic pagan books have been an inspiration to you? Share in the comments below. I was probably destined to become Pagan the day I picked up Tinker Creek as a freshman in college. It’s so sacred to me, I still have my original copy from almost 25 years ago. Dillard has been called the “female Thoreau” and her Tinker Creek a “modern day Walden“. The book opened my eyes to many things. In fact, much of the book is about the act of seeing. On my list of books I want to read: Refuge: An Unnatural History of Family and Place and An Unspoken Hunger: Stories from the Field by Terry Tempest Williams. Williams is a former Mormon, feminist, and environmental activist. It’s no exaggeration to say that David Abram transformed how I understand Paganism. Abram’s thought is an example of what Bron Taylor calls “naturalistic animism”. I first read Abram’s shorter essays which can be found on the Alliance for Wild Ethics website. 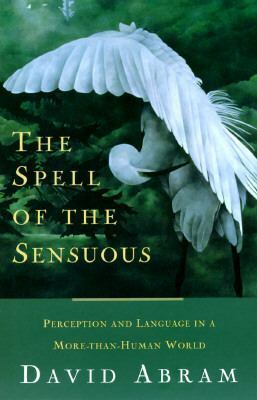 It was only later that I got around to reading Spell of the Sensuous and Becoming Animal. This is not about the projection of consciousness or agency onto “inanimate” objects, but openness to and reciprocity with a more-than-human community which transcends the subject-object dichotomy. Practicing animism requires returning to our natural awareness of our sensorial reciprocity with the material world. I’m still working this out in practice. On my list of books I want to read: The Handbook of Contemporary Animism edited by Graham Harvey. Harvey is a Pagan Studies scholar, but this book is a study of indigenous animism by non-Pagan scholars. I was introduced to Robin Wall Kimmerer by NPR’s On Being. She is a member of the Citizen Potawatomi Nation and Professor of Environmental and Forest Biology at the State University of New York College of Environmental Science and Forestry. 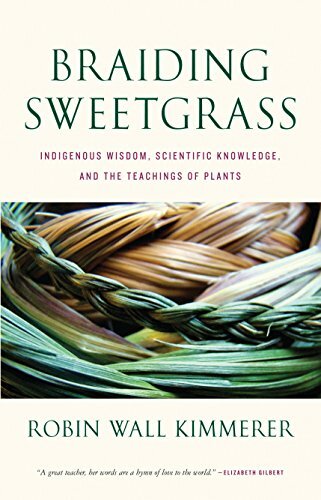 In her book, Braiding Sweetgrass: Indigenous Wisdom, Scientific Knowledge and the Teachings of Plants (2013), Kimmerer combines the wisdom of her indigenous heritage with her scientific training. Kimmerer writes about the surprising (at me, at least) mechanization of nature in contemporary botanical science, to which she contrasts indigenous cultures which teaches us about our reciprocity with the natural world. She also discusses our objectification of other-than-human beings through our language. Rather than describing other-than-human living beings as “it”, Kimmerer suggests using the pronoun “ki”. She is also the author of Gathering Moss: A Natural and Cultural History of Mosses, which is on my list. On my list of books I want to read: The Secret Teachings of Plants: The Intelligence of the Heart in the Direct Perception of Nature by Stephen Harrod Buhner. Although not explicitly Pagan, To a God Unknown is one of the most (small-p) pagan stories I have ever read. It tells the story of a man, Joseph, who comes to California to farm. He believes that a tree on the farm embodies the spirit of his deceased father, and he believes that the prosperity of the farm is connected to the life of the tree. Joseph talks to the tree and makes sacrifices to it. Following a very “pagan” fiesta, one of Joseph’s brothers, a devout Christian, kills the tree. A drought follows. I don’t want to spoil the end, but those familiar with Frazer’s Golden Bough will understand the meaning. On my list of books I want to read: Jitterbug Perfume by Tom Robbins. John Muir was an early conservationist and the founder of the Sierra Club. He wrote extensively about his exploration of the Sierra Nevada mountains of California, merging his inspiring personal experience of the sublimity of the natural world with a call for direct action to preserve wild nature. 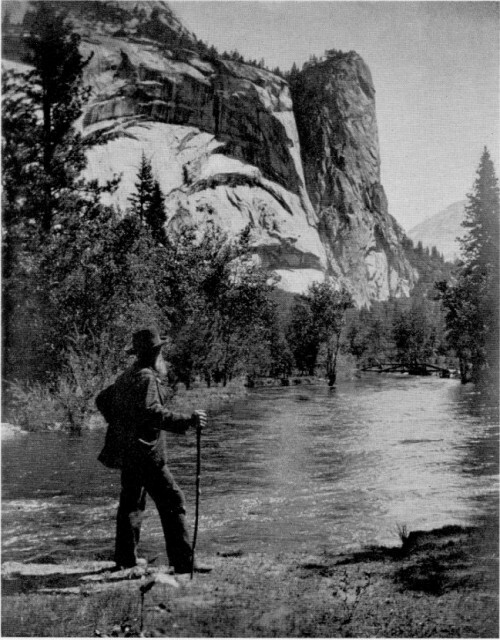 His activism helped to preserve Yosemite Valley and other wilderness areas as national parks. Like the Transcendentalists, Muir believed that nature was the revelation of the divine and direct contact with nature a sacrament. Muir often used religious language to describe his experience of the mountains, often drawn from the Bible. In some places, he seems more of a pantheists, or even an animist. Muir wrote about the interconnection of all things, a common pagan theme. He believed that direct contact with wilderness was spiritually nourishing and an antidote to civilization. Muir wrote several books and there are lots of books about Muir. 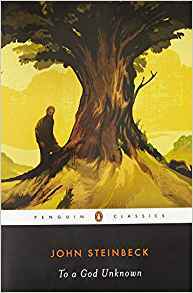 I recommend starting with The Contemplative John Muir: Spiritual Quotations from the Great American Naturalist or Meditations of John Muir: Nature’s Temple. On my list of books I want to read: Anything by John Burroughs. Maybe I’ll start with The Art of Seeing Things: Essays by John Burroughs or Harvest of a quiet eye: The natural world of John Burroughs. 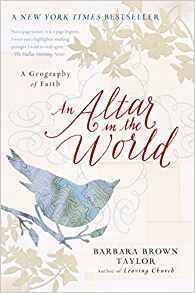 An Altar in the World is about finding the sacred in the mundane world–something that is central to my understanding of paganism. Taylor approaches spirituality from the belief that there is no spirituality apart from our bodily life here on earth. Therefore, she finds spirituality in the practice of attention to the most human of activities: making bread, making love, digging in the earth, and hanging clothes on a line. Taylor is a Christian, and she writes from a that perspective. But it is an inclusive Christianity, which does not exclude the possibility of genuine atheist spirituality. Though her spiritual practices arise from her Christianity, Taylor seems very “pagan”. In fact, the first story she tells from the Christian Bible is one of the most “pagan” parts of the Bible: When Jacob wakes from a divine dream, he sets a stone upright in the place and pours oil over it, to mark it as the house of God. The book consists of 12 chapters, each of which addresses a spiritual practice. Several of these practices have ancient origins, but Taylor presents them as arising out of everyday human experience. For example, for Taylor, the Sabbath is simply the practice of saying “no” and prayer is the practice of being present to the divine. Other practices Taylor describes include the practice of walking on the earth (groundedness), the practice of getting lost (wilderness), the practice of encountering others (community), and the practice of carrying water (physical labor). I think most of Taylor’s practices boil down to being present in our bodies and paying attention to the physical world. Each of these practices is, for Taylor, “an altar in the world” where people can meet the divine that, in her words, “some call God”. On my list of books I want to read: Grounded: Finding God in the World–A Spiritual Revolution by Diana Butler Bass. UU columnist Doug Muder has defined spirituality as the “awareness of the gap between what you can experience and what you can describe.” Thus, I think, poetry is a natural medium for spirituality. 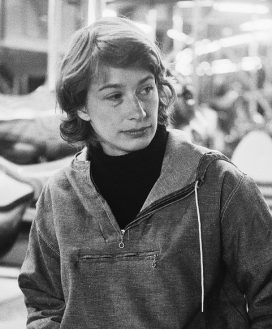 There’s lots of good poetry that evokes the experience of the sacred in the mundane, but two of my favorites poets are Mary Oliver and Rilke. Oliver’s poems “Wild Geese”, “Bone”, and “One or Two Things” have inspired some of the rituals which are a part of my personal practice. And some of Rilke’s poems have become regular “prayers” for me, like Book of Hours I 25 and Book of Hours, I 59. Other important poems for me have been e.e. cummings’ “Oh Sweet Spontaneous”, Algernon Swinburnes’ Hertha, and Teilhard Chardin’s Hymn of the Universe (not a poem, per se, but definitely poetic). And last but not least is Wordsworth, who admits, in “The World is Too Much With Us”, that he would “rather be a Pagan”. His poem “Tintern Abbey” expresses the feeling of lateral transcendence that I have experienced in nature. Other “pagan” poets I want to read more of are the Romantics like Schiller, Holderlin, and Byron, and contemporary poets Wendell Berry, David Whyte, and Adrienne Rich.